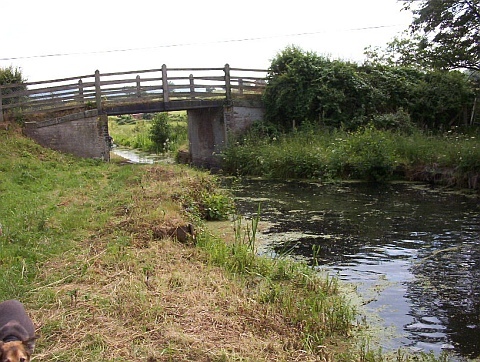 ﻿ Pete's MONTGOMERY CANAL PHOTO-SITE Arddleen, Poolquay, Buttington (Section10). 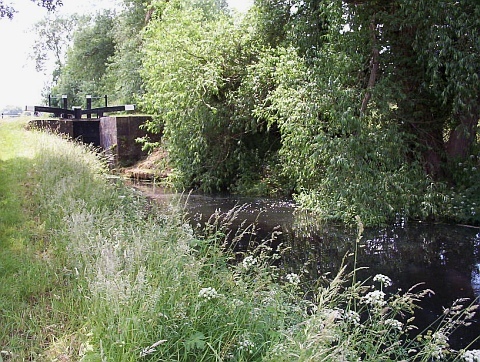 Arddleen, Pool Quay, Buttington (Section10)(Page1). 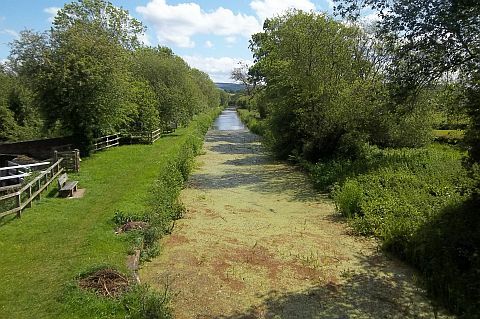 After leaving Burgedin Locks and heading towards Newtown, the canal heads into open countryside before swinging back once more to run parallel with the A483 Trunk road at Tirymynach. View from the top of Red Bridge No.106. Looking in the Welshpool direction. an engraved sign near the seat. Looking back towards Red Bridge No.106 from near the seat. Adjacent to Red Bridge ( 106 ) is the overflow weir to the river. Also nearby was a brick and tile works (owned by the canal ) and served by a narrow gauge railway from the nearby clay pits. 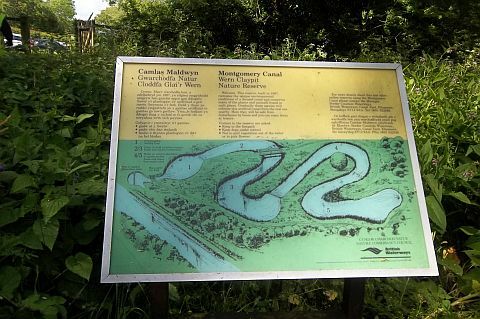 The clay pits now form part of the Clay Pits Nature Reserve. Picnic table and parking area is by the entrance. 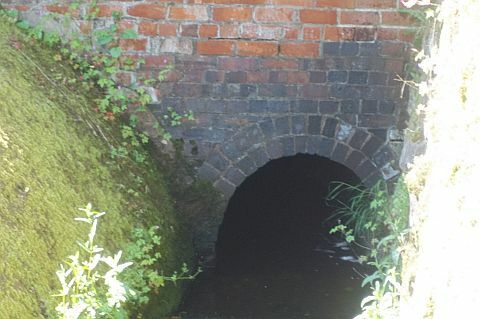 A closer view of the byweir. The old corn mill was immediately in front of you. The feed for the mill wheel was the one on your right. 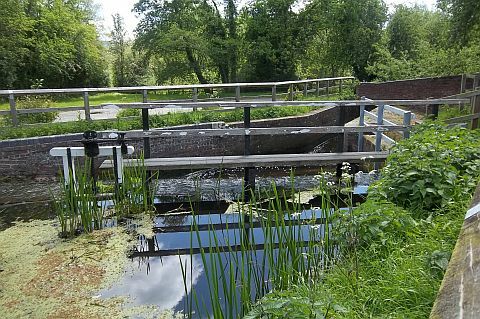 A view of the mill wheel feed. 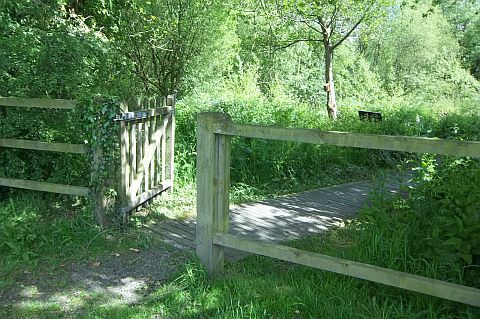 By the parking area, you will find a gate leading into the Nature Reserve. Entering by the gate along the path, another path goes off to your left. A sign is by the side. 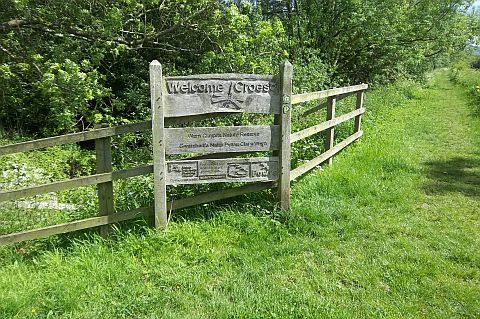 The sign by the side of the path showing the area of the Nature Reserve. 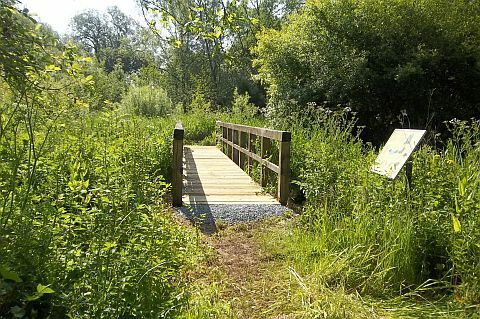 Continuing along the path, you come to a newly restored bridge. 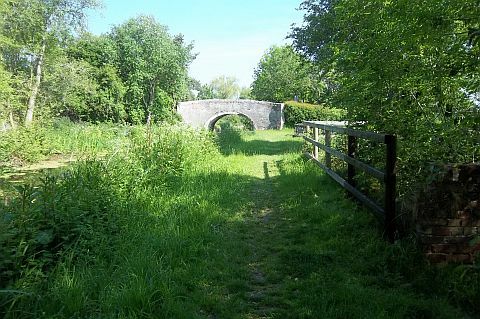 An attractive area after passing over the bridge. 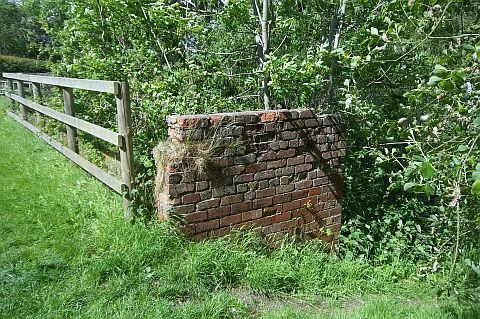 As you leave the Clay Pits Area and head in the direction of Welshpool, the remains of an old brick wall shows the site where the old corn mill stood. 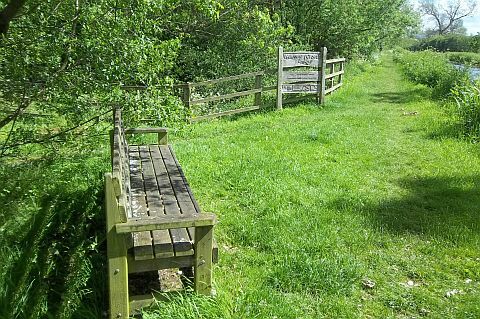 The next bridge after leaving the Clay Pits Nature reserve is the Gwern Middle Bridge. 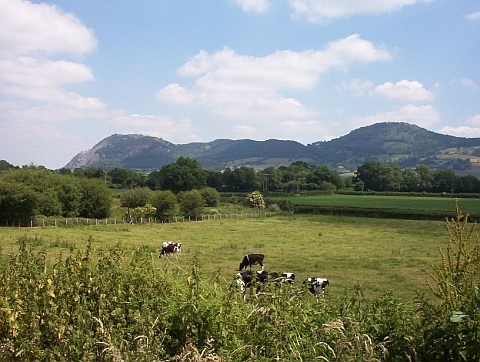 (Seen from the Tirymynach side). 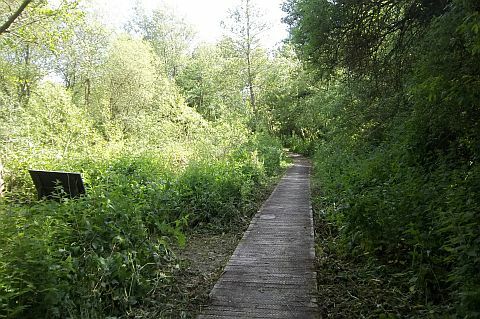 From here the canal follows a straight path before, first, a left and then a right hand bend bring it onto a course running parallel with the A483 trunk road at Tirymynach. 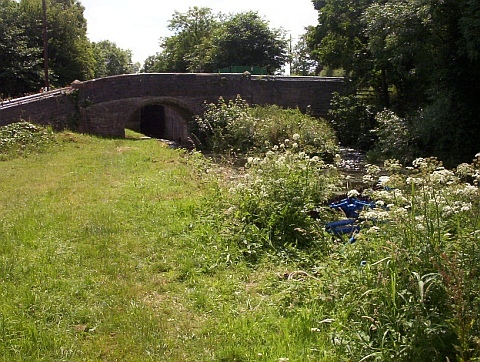 At Tirymynech, framed in the bridge hole of Bridge 109, you will find the bottom gates of Bank Lock. Bank Lock lifts the canal 8'6" from this bottom pound . 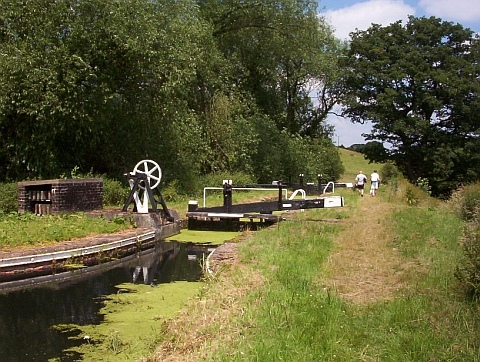 View looking towards the top gates of Bank Lock. 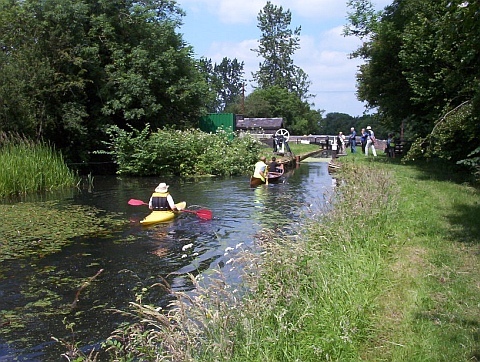 The familiar Montgomery paddle gear stands prominently by the lock side. It is possible to turn a small boat at this point. 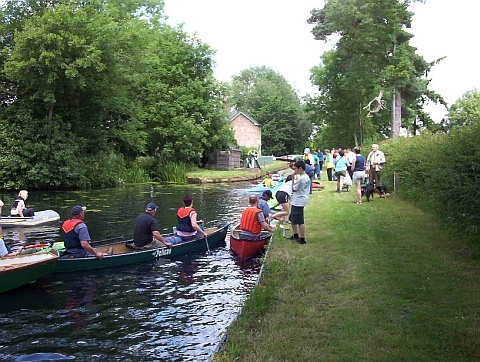 Photo taken during the 2005 Dinghy Dawdle. 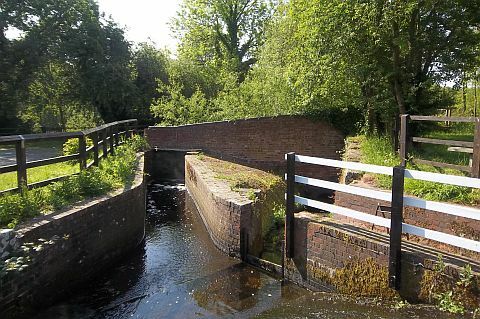 In the summer of 2000, British Waterways carried out major maintenance repairs to this lock, namely the rebuilding of the banking and lock chamber walls. Top Gate of Cabin Lock. The area above Cabin Lock showing the top gate and the familiar Montgomery paddle gear. The stop plank store is on the off-side. 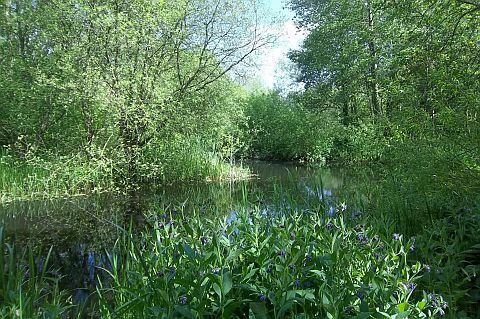 The tranquility of this area is well expressed in this scene. This is the pastoral scene looking across the valley from Cabin Lock. On top of the hill to the left is Rodney’s Pillar. 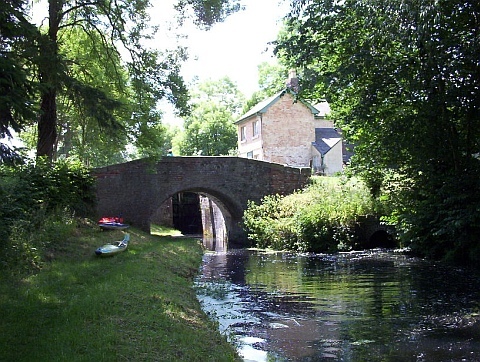 In a pleasantly wooded setting, Bridge No.110 frames the bottom gates of Crowther Hall Lock. Crowther Hall Lock has a rise of 9' 2". To the left of the photo, screened by the trees, you will find a winding point. This photo was taken during the 2005 Dinghy Dawdle. You can close this page with your X button..